Notre Dame professor Elliott Visconsi has co-created a new app for the iPad called The Tempest that he says helps accelerate student learning by allowing them to develop deeper comprehension in less time than solitary reading. At the heart of the app is a social network that encourages students to communicate their interpretations and collaborate with others. "We've found that most people learn best when they are in the role of author, creator or collaborator, when they are teaching others," Visconsi said. We spoke with Visconsi about transforming Shakespeare for the 21st century and why the intensely social experience of the app is what, in essence, the humanities have always been about. The following is an edited transcript of that conversation. The Tempest app is described as transforming Shakespeare for the 21st century. How does it do that? And why do you think Shakespeare needs to be transformed for the 21st century? Elliot Visconsi: We are trying to lower the entry cost of difficult content like Shakespeare by adding in great tools and features that allow readers from all backgrounds to grapple with, appreciate, and love a beautiful and moving play like "The Tempest." We are not rewriting or modernizing the text; we are putting the play at the center of a social network, a distributed learning network in which the play is an invitation into a sustained, living experience. The play is the center of a generative ecosystem that includes all of our tools and content, but also the presence of others both past and present (other readers, faculty commentators, performers, artists, fellow students and teachers). Rather than the individual reader working privately and alone in solitude with the play, we see the mobile reading experience as becoming intensely social as the way that the humanities have always been social and have always depended on exchange and collaboration. It sounds like you are bringing Shakespeare to the stage that many people find themselves on today, which is a social media platform of some kind. And as a result, you are encouraging people to interact with not just Shakespeare, but with each other's thoughts and interpretations of Shakespeare. Visconsi: Absolutely. We've found that most people learn best when they are in the role of author, creator or collaborator, when they are teaching others. We put our readers in the driver's seat; we want you as a reader to love and understand Shakespeare, and we feel the best way to do that is to give you the tools to take ownership of the experience and to speak to others, collaborate with others, create and share new commentaries on the play, rather than simply receiving or consuming a play that may be difficult because it's relatively remote historically. 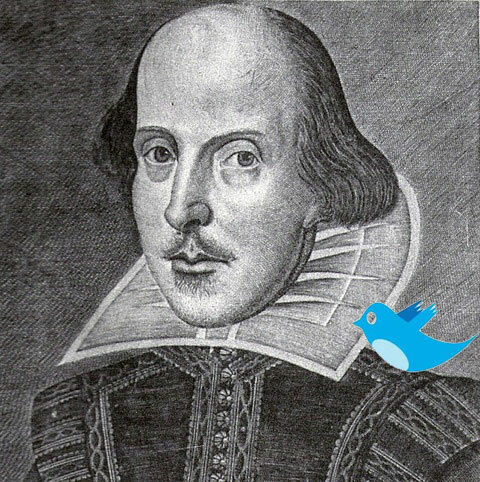 You alluded to some of the features within the app, but could you be more specific about which features you've found that enhance students' appreciation and comprehension of Shakespeare? Visconsi; We've found that the audio tools (the main track supplemented by the alternative takes -- which we call AudioPlus) are immediately available to all of our readers. Whether those readers are seventh graders, professional actors, or teachers and students, the audio is a great success -- more so, I think, than video would be. That tool makes it apparent how crucial performance is to understanding, especially in that it makes obvious the choices of the director or the actor or the writer in creating emphasis. This may be an obvious point for actors and teachers, but every encounter with the play relies on a set of choices about where to lie emphasis on how to interpret an act, a gesture or a phrase; once you reveal that fact to readers, they are now in the director's role. The reader can then think about a third way of creating emphasis, and using the iPad, record it and share with classmates. MyPath is very well-received; it allows teachers and students to cut and arrange and share the play effortlessly. You can see a part, create a selection of key passages, and write about them or perform them. All of that content is sharable, and the reader owns it. We've also had people use MyPath as a way of preparing students for class, by selecting a few passages for study and sending them to their students. The faculty commentaries have also been quite popular. We've gotten a lot of positive responses to those short interpretive takes -- both from the writers and readers, and our team of experts is full of leading scholars from top universities worldwide. We also have one scholar who has written in Mandarin. Faculty love writing these short riffs on the play. They aren't meant to replace the classroom but begin conversations, introduce key ideas and such, in the way that we might do for an introductory Shakespeare class or a lecture for parents' weekend. I was interested when you were saying that the humanities have always been social and about collaboration and communication. So it seems you are modernizing the humanities lineage with the communication and collaboration tools of our time. Could you tell us how this app, in essence, is what the humanities as always been about? Visconsi: Absolutely. [Tempest co-creator and Bryn Mawr College professor] Katherine Rowe and I both have a deep commitment to the liberal arts model in undergraduate education and to the humanities in general. We wanted the app to replicate longstanding humanist practices. The humanities has always been about the robust exchange of intellectual ideas across space and time. Whether that takes the form of a dynamic "republic of letters," one philosopher or poet rewriting a precursor, or an interpretive argument between scholarly peers about Prospero's "revels" speech, humanist practices celebrate collaborative exchange, argument, and interpretive depth. Innovation happens, we think not as the efforts of a solitary genius writing or working in a vacuum but rather in communities, teams and networks. "We wanted collaboration, interpretive depth, and the exchange of ideas to be the very foundation of the reading experience, and not just an overlay." Minds are located within communities, and communities may be physical or virtual. We believe that understanding, comprehension and innovation happens in the context of other minds. Sometimes you access other minds through their writings; sometimes you access them in real time. And we wanted to make that premise the heart of our app. We wanted collaboration, interpretive depth, and the exchange of ideas to be the very foundation of the reading experience, and not just an overlay. We supply a great audio performance and supplement that with recordings of alternative takes on key passages, to really clarify how a performer's emphasis changes understanding. That's also why we have 10 faculty commentators instead of one. There is no single authoritative view we hope to promote; we provide several high-quality prompts to nudge our readers forward. And then we add curricular ideas, pedagogical exercises, and great sharing tools. As a reader, you hear version A and version B -- now the app prompts you to create version C. We try to put the reader into the position of the creator as often as possible. With these authoring tools, you are providing an environment in which people are encouraged to produce and not just passively consume. So what kind of impact have these social tools had on student engagement, comprehension and appreciation of "The Tempest?" Visconsi: Students and teachers get further into the play faster, with deeper comprehension than by solitary reading. Along the lines of the flipped classroom metaphor, we have seen students working at a higher level in class, demonstrating deeper interpretive sophistication, and handling textual details with much more ease. They are prepared to get into complex philosophical issues sooner. They come to class better prepared, asking more strenuous questions. By getting deeper into the play and sharing notes and reading together, students are more confident. And they feel they can look to their peers in moments when they need guidance. So the app is expanding the footprint of the class. The classroom is becoming ubiquitous. Meaningful conversation can happen anytime. We've found that our readers have a better intuitive understanding of the role of performance in a work of dramatic literature, and that they have expressed a lot of pleasure in discovering Shakespeare in this format. The responses have been uniformly positive; it's thrilling to hear back from readers all over the world who are using the app and enjoying it immensely for school or pleasure. If at the heart of understanding Shakespeare, or any text for that matter, is not only decoding the text, but also being able to communicate your understanding in a collaborative social environment, then it seems your app is providing a kind of cross-training platform for exercising the range of intellectual muscles that are foundational for a humanities education. Visconsi: I think that is a great metaphor, Aran! It really is a cross-training platform for Shakespeare. Love that. As developers, we didn't want to merely replicate print or put a PDF on the iPad or make it easier for students to consume Shakespeare on the iPad. Our tools are designed to generate ideas, start conversations, facilitate sharing -- students and readers of all kinds should be creators of content, authors and collaborators. They should learn from and teach each other. They should argue with each other, and weigh competing interpretations. I think that is a really important part of humanist practice. If you don't like an idea, position or interpretation, you are invited to make a more persuasive case, a more compelling interpretation. That's what we do in the humanities. We didn't want this to be the authoritative version of the play to be admired or read in solitude; we want it to be a generative version of the play, one which sparks innovation and creates new knowledge. Is there anything next after The Tempest? Is there anything else in the pipeline? Visconsi: We are developing four additional plays using the same template as The Tempest for iPad: These are "Othello," "Macbeth," "A Midsummer Night's Dream," and "Romeo and Juliet." We have most of the content already in the can. Forty-four or so university faculty and high school teachers have written for us and enjoyed it a lot. We are also building a product line working with a national theater company to mirror and extend a live performance. One of our great aspirations as developers is to share what we do in the humanities with a much larger audience than we're used to. A "MOOC" on modern and contemporary poetry taught by Al Filreis at Penn and hosted by Coursera, for instance, had 34,000 students registered when it went live back in early September. So there's an appetite out there, a huge hunger for quality content. As humanists, I don't think we've done a good job communicating what we do to that broader audience. 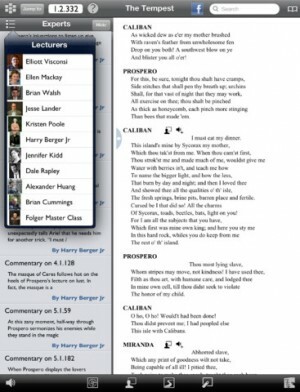 The Tempest for iPad is one way of trying to solve the audience problem for the humanities. We know the audience is there, and we hope to reach as many readers as we can through this and our subsequent apps. We have readers in 24 countries worldwide, and we are getting reviewed in leading venues such as the Times Literary Supplement. It's exciting, and has been wonderful to share news of the project. Any miscellaneous thoughts or comments? Visconsi: We believe that The Tempest for iPad and our subsequent Shakespeare apps aren't replacing other traditional media forms or cannibalizing market share from printed books. Some change is inevitable, and there will be some rearranging of ratios, but we are not out to destroy print or replace the book. We believe that print and web-based publishing are durable and important, but we think that mobile apps are especially well-suited to creating an intensely collaborative and richly textured reading experience. Aran Levasseur is the Academic Technology Coordinator at San Francisco University High School. You can follow him @fusionjones on Twitter. This post originally appeared on MediaShift, which covers the intersection of media and technology. Follow @PBSMediaShift for Twitter updates, or join us on Facebook.